1.a silicon rim is placed on 3.5mm audio plug, please remove it if necessary. 2.Please put the device into its specialized case to protect it from dust or others when no using so that you can enjoy a long battry life. 1.Short press the power to turn on the speaker, the LED indicator will turn blue. This is power save mode, it will turn off automatically after 5 minutes iif there is no audio input when using. 2.Long press the power to turn on the speaker, the blue LED indicator will flash 3 times and then bule consitant light on, this is the mode without Auto turn-off. 4.Use your connected device to paly music/video and to comtrol volume leavel. 5.Short press to turn off the speaker, the bule indicator light off. PLUG and PLAY: The 3.5mm Aux jack makes it much easier to play the music whenever you want through the iPhone, iPad or iPod. No more worry about the "Bluetooth disconnected". COMPACT SIZE with HIGH SOUND QUALITY: With the compact size as small as a golf ball, this product has a 3W speaker in 27mm 8ohm and SNR>90db to keep the high sound quality with clear bass. 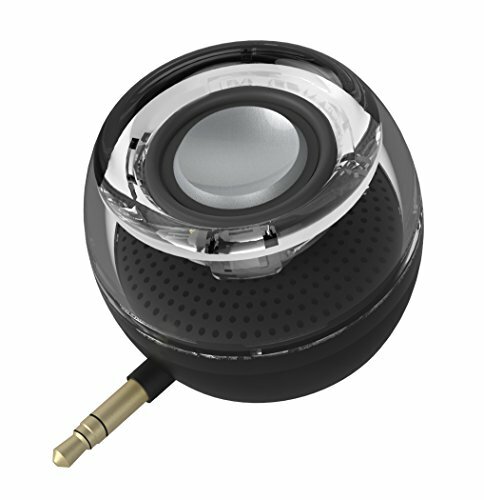 COMPREHENSIVE COMPATIBILITY: This line in speaker could be used to most of the smartphones with 3.5mm aux port, even the ones with phone cases. It is also suitable for the desktop/laptop computer, tablet/pad, MP3/MP4, TV or PSP without connection or paring issues like the bluetooth ones. LONG BATTERY LIFE: This portable mini speaker has a 250mAh RECHARGEABLE Li-ion battery built. Once idled for 5 mins, auto-off function will work to save the power. Once battery drained out, only 45 mins needed to get a full charge through the Micro-USB port. FULL MONEY BACK GUARANTEE: Manufactured by the OEM factory for the world famous brands, this speaker has a top quality control process so that we could provide the full money back guarantee if you are not satisfied. If you have any questions about this product by Leadsound, contact us by completing and submitting the form below. If you are looking for a specif part number, please include it with your message.